Is it Time to Start Horsing Around? Not Getting Enough Time to Study the Form Properly? It is Time to Start Horsing Around. To Join Click The Register Button on the Right. Or Visit us on ourFacebook Group to Learn More. STOP! If you are looking for a Get Rich Quick Scheme then please GO AWAY. Horsing Around is not and will never make that claim. 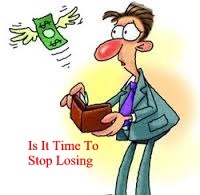 However if you are want to become a better punter and win more often than please read on. 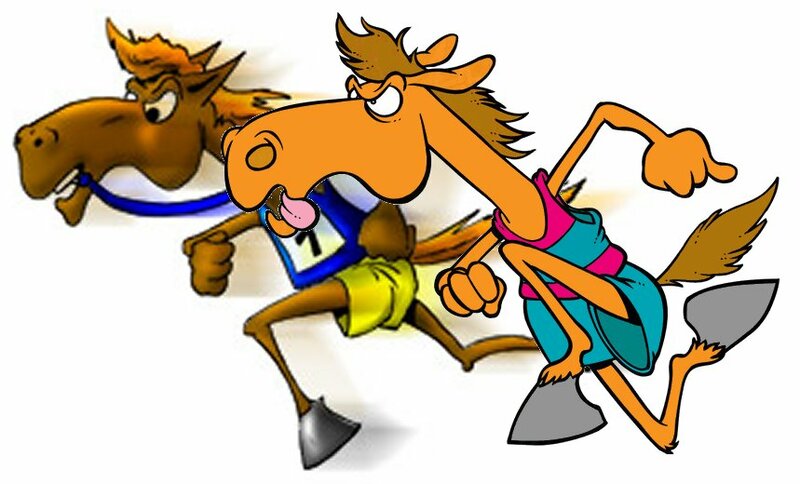 Horsing Around is designed to help those punters who like to do their own form. Most punters like to study their own form and bet on their own selections. We study the form of each horse in a race and consider the ability of the jockey and the ability of the trainer. We look at the horse's record at the track, the horse's record at the distance and the horse's record on the surface. We take into consideration the horse's class (best ever performance) and then analyse the most recent runs in terms of race grade, winning or beaten margin and any change in weight or track conditions. Next we look at the barriers and the speed maps and maybe their first up record or whatever else we decide could be relative to that horse's winning chances. And eventually we either decide that this horse has a genuine winning chance or we put the pen through it. We do all this because it is challenging and it is fun and we all get a great sense of pride and achievement when we cheer home a winner we have selected ourselves. This initial run through the form guide can be very time consuming and all we have really acheived is to narrow the field down to a few main chances. We should then be looking at race replays and barrier trials, sectional times and stewards reports, listening to the jockey and trainer interviews and taking in the expert opinions before eventually deciding how and where to invest our money. However to do this properly takes time, time we do not always have and this is where Horsing Around comes in. Horsing Around uses a computer program to study the form as described in the first paragraph above and displays the findings in such a way that the results of that (previously) time consuming form study jump right off the page at you. The horses are listed in winning chance order and a quick glance at the Ratings Breakdown shows you where one horse has an advantage over another by displaying which horses have the best jockeys, the best trainers, the best records at the track, the best records at the distance, the best records at the surface, the most class and the best recent form in an easy to read table. They say a picture says a thousands words and in the case of Horsing Around a picture summarises a thousand form lines. 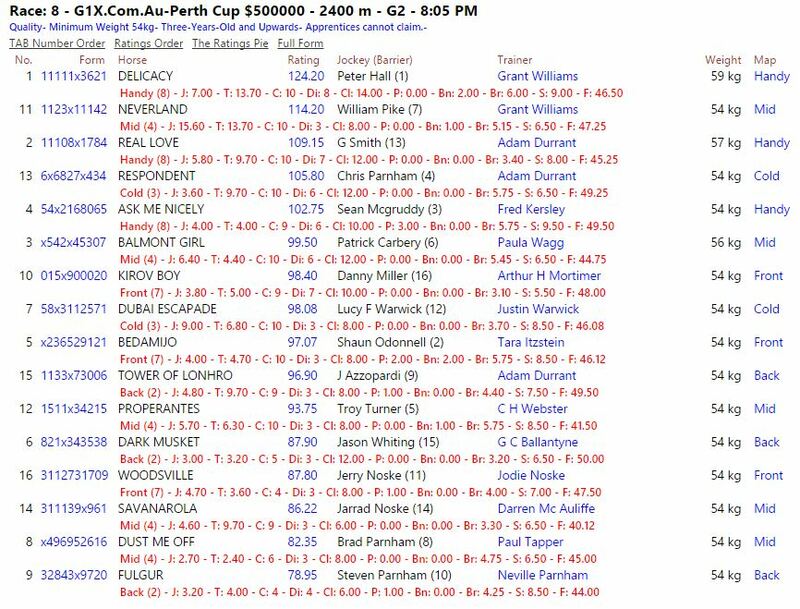 Below is an image of the Horsing Around Page for the 2016 Perth Cup. The total rating is shown at the top (simply the sum of all the parts) while the number beside each horse's name in the Ratings Breakdown is the individual points awarded for that category. Horsing Around calculates the total rating by giving each horse points along the way. The jockey and trainer are given points based on their strike rate over the last 300 races. The points for the record at the track, the record at the distance and the record on the surface are based on the number of wins and places each horse has acheived and range from 1 (for a horse that is unplaced 4 or more times) to 10 (for a horse that has won 3 or more times) with a horse that is relatively untried in any category being awarded 3 points. The points for class are awarded based on a horse's best ever performance with a horse that has never ever been placed getting zero points while a horse that has won at Group 1 level gets 14 points. The points for recent form are a little more complicated but are based on the race grade, the race prizemoney, the track location, the official race margins and any change in weight. Each horse is also given points for the barrier and their likely position in running and Bonus and Penalty points are awarded for certain aspects of their recent form. All of these individual points can be found by clicking on the rating pie link for any particular race. The final rating for any horse is then just the total of all the points given for each category just described. 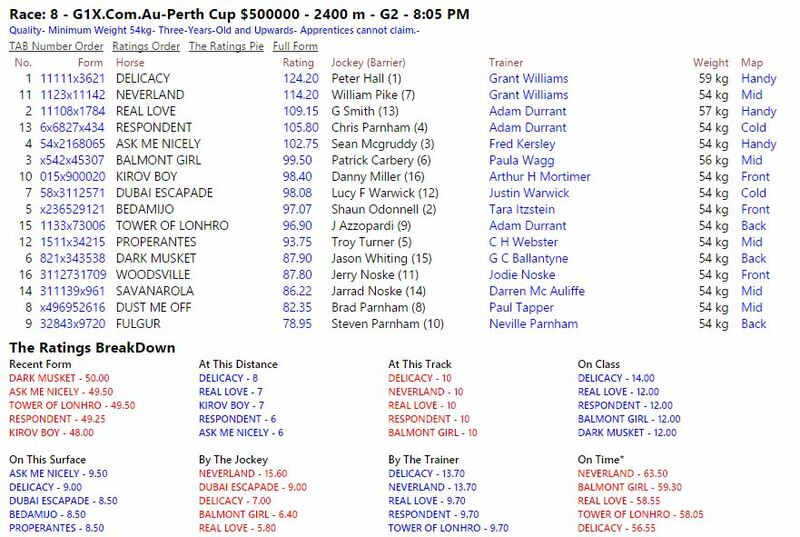 The Top Half of the Perth Cup Page Showing the Ratings Pie. Users can switch between the basic page, the ratings pie page or a full form page by using the links at the top. So as you can see Horsing Around is not claiming to be a magial winning formula but merely a quick, extremely logical and very transparent way of helping the average punter save time when analysing any horse race. This means you will have more time to listen to the experts and the interviews and study the vision and the reports and ultimately make a better decision as to where and how to place your money. And even if you do none of that extra stuff (many of us just do not have the time), just studying the Horsing Around page and combining what you learn with your own skills and knowledge will still lead to a more informed decision in a much shorter space of time. The more informed decisions you make, the more winning bets you will place and the better punter you will be. It is that simple and soon you will wonder how you ever managed without Horsing Around. Now that final step, the time between studying the Horsing Around page and placing a bet requires the user to input their own knowledge, instincts and betting style. The statistics associated with the Horsing Around ratings are very impressive. 22% winners from the top selection, 51% winners from the top 3 selections and 70% winners from the top 5 selections. These numbers indicate that Horsing Around is a very powerful tool and the top few selections should always be respected. However each races throws up many questions and users need to maker their own judgement calls as how best to proceed. If there is a horse that is very short in the market but not high in the ratings then the users must investigate why and users should be prepared to promote and demote horses up and down the ratings based on their own judgement. For example a horse that has won 3 times on the track will score 10 points for this category. Whereas a horse having his first attempt at the track will only get 3 points for the same category. The user may decide that this tight turning track will suit a particular horse and so decide to overrule the ratings and promote this horse up the list. A similar situation can occur for horses having their first run at a distance or first start on a heavy track. The number of possible scenarios for each race are endless and we can not go possibly go into them all here. What we will say is that if you a good punter, then using Horsing Around ratings will make you a better punter and if you are a bad punter, then using Horsing Around ratings will make you a much better punter. And even if you never look at a form guide and just back the top selection you can at least be happy in the knowledge that your bet was decided by a detailed form analysis and not a lucky number or nice sounding name. To join click on the register button on the right and fill in the details. Your email address will be user name. Oh Yeah! We hate junk mail so we will never use your email for anything else. We just need to know you are real and to help out if you forget your password one day.